There are many wonderful things about being a woman, but our increased risk of autoimmune disease is not one of them. Autoimmune diseases are essentially civil wars within the body — the body’s immune system attacks its own organs and tissues. The term “autoimmune” covers a wide variety of conditions, from rheumatoid arthritis and multiple sclerosis to the lesser-known conditions of Hashimoto’s thyroiditis and SjÃ¶gren’s syndrome. One commonality of these conditions is that they affect women much more frequently than men. In some cases, this g ender bias is quite striking; Hashimoto’s thyroiditis, a condition in which the immune system attacks the thyroid gland, affects women ten times more often than men. Some autoimmune diseases, however, are less biased; type I diabetes, for instance, affects women and men at approximately the same rate. 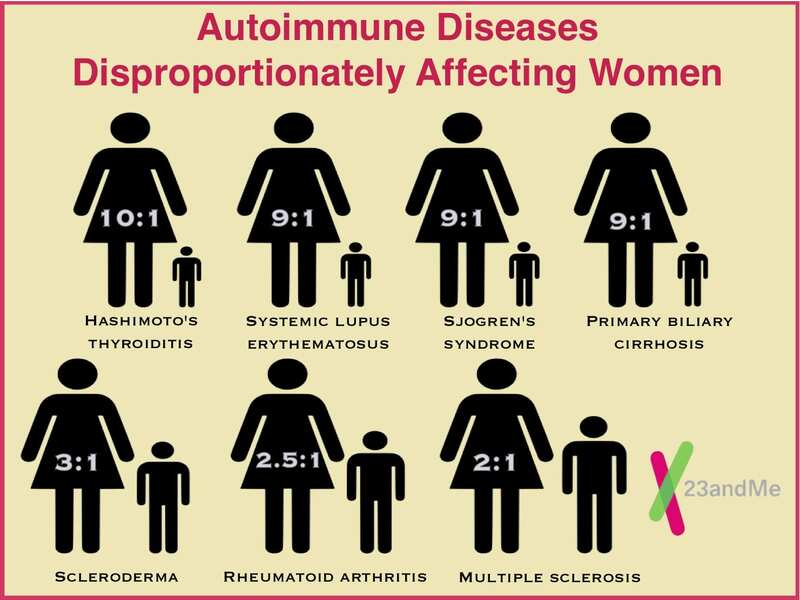 Why women are disproportionately affected by autoimmune disease is not fully known or understood, although the hypotheses are numerous. Some research suggests that estrogen may help antibody production and immune system response, but can also lead to an overly active immune system. Other research indicates that genes on the X chromosomes may play a role in these immune system mutinies, and women — who have two X chromosomes — may thus be at an increased risk over men who have only one X chromosome. Still other research suggests that “fetal-maternal microchimerism” may be the root cause. In this strange-sounding phenomenon, a small number of the baby’s cells pass through the placenta into the mother and continue to live within the mother. The presence of these foreign fetal cells within the mother may result in an incorrect immune system response and autoimmune disease. More research, however, is needed to establish which of these hypotheses (if any) are correct. Autoimmune diseases are serious medical concerns for women; indeed, when taken together, autoimmune diseases constitute one of the top ten causes of death among young and middle-aged women. The irony of these conditions is that the immune system, which should be a woman’s greatest ally in fighting disease, becomes her worst enemy. Why and how a body’s betrayal occurs needs to be better understood through further research.